When Catherine (Nicole Kidman) and Matthew Parker’s (Joseph Fiennes) two teenage children suddenly vanish in a dust storm, the couple's relationship is pushed to the brink as they confront the mystery of their children’s disappearance in the soaring desert heat. Also stars Hugo Weaving. Anyone else oddly attracted to this project? 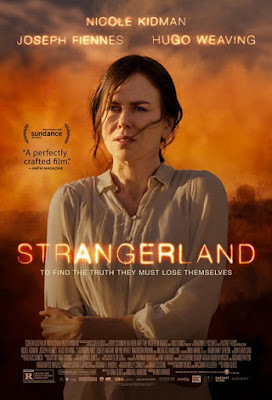 STRANGERLAND, which also stars Joseph Fiennes, Hugo Weaving, is in theaters and on demand on July 10. I'm nervous about this one, but I'm sure I'll see it eventually...and I'm with you on her face.